About a month ago, after finishing my grocery shopping, I headed to the self-checkout lanes as I usually do. But they were cordoned off with yellow crime scene tape. I’m one of those people who generally prefers helping myself. Why waste time chatting with a cashier and watching someone bag your groceries when you can zip through by yourself (especially on those days when you’re feeling like Oscar the Grouch). I asked the cashier why they were getting rid of the self checkout and she muttered something about customers having a hard time using them. I wondered if that was her opinion or management speaking. So I did some research on my own and found out that shoppers are facing withdrawal from self checkout at more than just my local Shaws. My search brought up stories about Wegman’s, CVS, and Costco, among others. Will we see more companies removing self service? It’s hard to imagine that banks will do away with ATMs or airlines will scrap ticket kiosks. It turns out that self checkout was adopted as a savings play – replacing cashiers with machines. But stores are finding that their human resource costs haven’t gone down since the cashiers are employed for other tasks. I found little about rumored losses because of theft while using self checkout or dissatisfaction with the technology as long as there were other options. What about the investment in self-checkout machines or other costs that will undoubtedly increase when self checkouts are removed? The margins that supermarkets run on makes it hard to understand how machines can be tossed aside so cavalierly. But is it inevitable when companies don’t think strategically when they implement technology? What is the customer experience? In my travels, I’ve found that some self checkouts are better and more intuitive than others. Training goes hand in hand with customer experience. I’ll go to one store and the self-checkout babysitter will practically ring my order for me, while at another there’s no one to be found when the red light starts flashing (and when they finally arrive, they badmouth the technology). This says nothing of stores that do such a poor job training their cashiers that customers prefer self checkout to standing in front of a teenager cracking gum and talking to her co-worker instead of you. What do your customers want? Understand what channels different customer populations prefer and make them easy and accessible. If people complain that they don’t want to do the job that cashiers should be doing for them, let them use cashiers. Offer a range of options that meet customer needs and wants over the long term as well as in a moment of truth (like when I’m late and just need to buy a quart of milk, or when I’m purchasing a very personal item at the pharmacy). If the back-out plan includes removing a channel that many customers are accustomed to, consider the implications. I’m not talking about a 12-step program here, but advance notice, rationale behind the decision, and any added benefits for using manned checkouts. 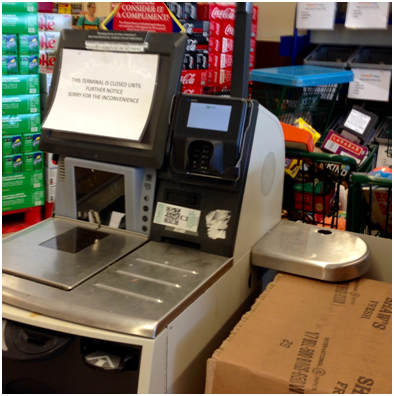 Opponents say self checkout is impersonal, and stores are touting the return of personal service when grocery shopping. If I want a personal experience, it’s when I go to my hair stylist, or to my favorite restaurant. At the supermarket or drug store? Not so much. Elaine Cascio is vice president at Vanguard Communications Corp, a consulting firm specializing in customer experience, self service, contact center processes, operations and technology.